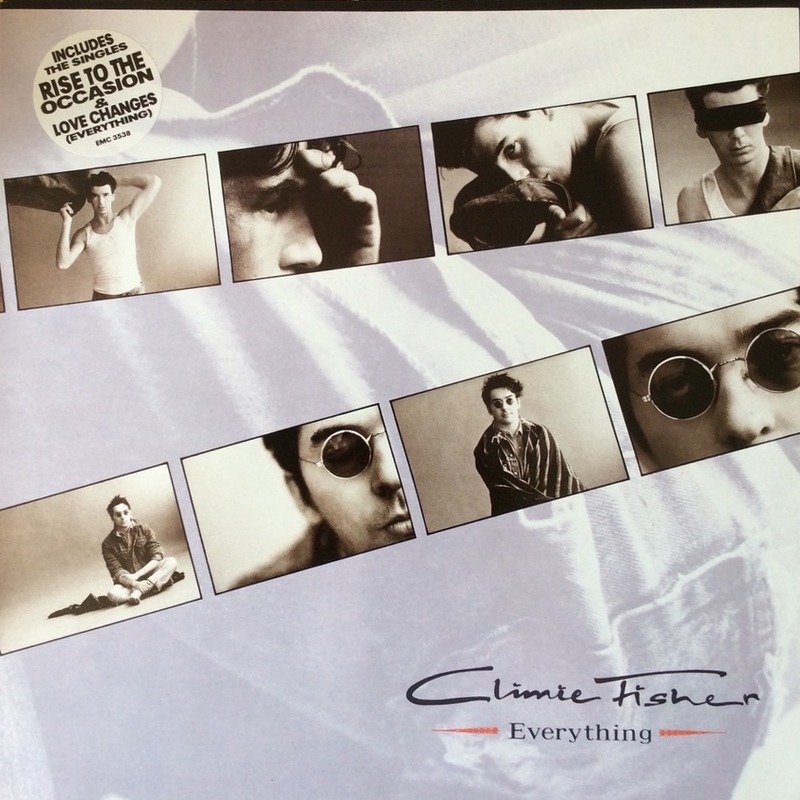 Today’s POP RESCUE from a loveless fate, is the 1987 album Everything from duo Climie Fisher. This 11 track LP opens with hit single Love Changes (Everything), a song that I remember well from the late 1980s, thanks to its appearance on a NOW! album. This is quite a gentle but catchy track. Simon’s vocals are soulful and like a softer Rod Stewart at times. The song flows perfectly, and backing vocals including plenty of ‘oohs‘ and ‘do do do‘ parts to help make sure everything is expertly woven together. This is a great song, but on it’s first release in 1987, the single flopped at #67, but when it was re-released as their third single seven months later, it became their biggest hit – reaching #2. This is followed by the album version of second single, and the duos first hit, Rise To The Occasion. The tempo slides down a little giving Simon a place to show off his softer ballad vocals. This feels like some pretty stalwart 80s pop-rock territory, and reminds me of something you might find lurking on a Bros or Owen Paul album. Fifth and final single I Won’t Bleed For You follows, fading in with some great strumming guitars and hard beats. Again, it reminds me vocally of Bros, although musically its heavier than that – courtesy of the guitars. There’s a great synthy bassline and beat combination here, and the chorus gets a boost courtesy of the backing vocals. Sadly the song stalled at #35 in the UK chart. Room To Move follows, with some great synths introducing this bouncy but slightly downbeat track, which builds up nicely towards a kind of pop-gospel number towards the end. Best to stick with this track as it rewards you by the end. Precious Moments is up next, and this has an almost dreamy or lullaby feel to it – and for a fleeting moment I hear echoes of Michael Jackson. The song fits its title perfectly, and as the lyrics unfold, I feel like I just want to give Simon a bit of a man-hug. Bizarrely, side one closes with a remix – Rise To The Occasion (Hip Hop Mix) – a remix by PWL’s remix Svengali Phil Harding. This sounds quite dated simply through the choice to use the then contemporary sounds and samples. The track itself has a plodding best throughout, yet Simon’s soft vocals aren’t affected. This makes it feel s bit disjointed, but the track gave them their first top ten hit (reaching #10) when it was released as the second single. Side Two opens with single This Is Me, a song which the sleeve reveals has Kirsty McColl on backing vocals. The song has a great bouncy intro and feel right through. There’s plenty of synths in this song – giving it a wonderfully 80s feel that builds up. It also has a great bassline. Kirsty’s vocals seems to pretty much fall under the radar until the final run where she seems to get an airing after the key change, but she’s hardly centre stage and I would never have noticed her if I hadn’t read the sleeve notes. This track gave the duo a #22 hit. Kirsty returns for next song Never Let A Chance Go By, which starts off with some heavy rockier guitars and beats. By contrast Simon’s vocals sound a bit too soft, but the guitars come down to meet him. This sounds quite nice, vocally and musically, but it’s only bits of the chorus that makes it a memorable song. Bite The Hand That Feeds follows this, and this starts off with a rush of piano and hi-hats. This has a great chugging guitar and bass waiting for the moment where they can be unleashed, and it’s the second verse where this happens. The chorus is fairly weak, and there’s even a moment where I’m reminded again of the BBC Eldorado theme when some oddly placed mock-Spanish guitar turns up. The backing vocalists Soultana put in a great performance – really helping to carry the song along before it switches over to a drama drums finale. Break The Silence is the penultimate song here. This is quite a nice song, and again at times I’m hearing echoes of Rod Stewart in Simon’s vocals. The track is pretty catchy, even though it’s quite a slow track. There’s even some vocal sampling going on here too! The album closes with Keeping The Mystery alive, which really bursts in like a Bros track. It’s upbeat, louder, and heavier than most of the other tracks on this album. Soultana put another great performance in, as does Simon, who uses this song to show off his vocal diversity well. Why this wasn’t a single, I don’t know, it’s a fantastic track. Over all, this album is a great example of mid-80s pop rock, but at times, I find that Simon Climie’s vocals are a little bit too soft and soulful here for some of the tracks, resulting in songs that just miss the mark slightly. Whilst there’s no duff track here, and Simon’s vocals are great, he just feels a bit mis-matched to this sound. Backing singers Soultana and keyboardist Rob Fisher put in a great performance through-out and this helps the songs. Kirsty McColl, who had already had a number of hits, is tucked away here – undoubtedly due to her husband Steve Lillywhite having production credits. She feels greatly under-used here, and it would have been nice to hear her making more of a vocal ‘duet’ with Simon. Where are CLimie Fisher now? The duo managed to score one further top 30 hit in December 1988 with Love Like A River, which reached #23. Their next three singles struggled, ranking at #50, #89, with their final single It’s Not Supposed To Be That Way, stalling at #77 in 1990. The duo’s second album in 1989, Coming In For The Kill, didn’t perform as well as their debut, reaching #35. After the break up of Climie Fisher, Simon Climie continued to write, record and produce, and also released his solo album Soul Inspiration in 1992. His work has been recorded by artists including Eternal, Louise, and that famous George Michael and Aretha Franklin track I Knew You Were Waiting (For Me). Rob Fisher went on to work with Rick Astley, but also returned to work with former-Naked Eyes band-mate Pete Byrne. Sadly, Rob Fisher died aged 42 in 1999 following bowel surgery. Everything and Coming In For The Kill were re-issued in 2009 each with a number of bonus tracks. Posted in 1980s, Climie Fisher, Kirsty McCollTagged 1987, album, I Won't Bleed For You, Love Changes (Everything), Phil Harding, PWL, review, Rise To The Occasion, Rise To The Occasion (Hip Hop Mix), Rob Fisher, Simon Climie, Soultana, Stephen Hague, Steve Lillywhite, This Is MeBookmark the permalink.